This is a one of a kind LIMITED EDITION Sid Dickens Memory Tile. 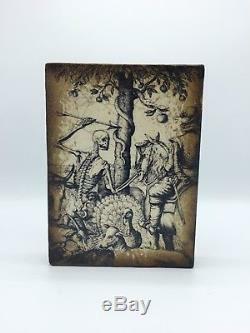 This tile was made for Sid Dicken's annual tile event party in November 2018 for retailers and collectors. Unlike most limited editions tiles that Sid Dickens studio produces this tile is a one off and is designed by Sid himself. What influenced or inspired this tile is unknown but it is very much an authentic design that Sid Dickens is traditionally known for. The November tile party is the perfect place where Sid gets to experiment and play with different styles and even finishes for his tiles. This tile is the perfect addition to help make your collection extra special and exclusive! It also makes the perfect gift to help enhance a loved ones collection as well. This tile is ULTRA RARE and ONLY available at the annual VIP customer sale held in Sid Dickens official studio in Vancouver, British Columbia, Canada. 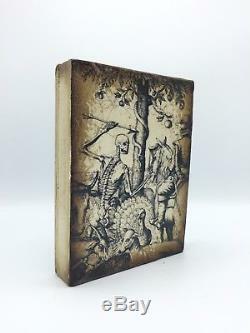 This tile is stamped "LE 18" on the back and is signed by Sid Dickens and dated 2018. Like any fine piece of art, which is rare and made in exclusive batches, these tiles appraise more so than any other tile. The beautiful tile is very similar to some of Sid Dicken's oldest work in regards to the black and white design. This tile feature a man holding a spear lunging towards a man on a horse. This dark and eerie tiles tells an interesting story. This piece goes perfectly with the other black and white tiles in the store. Tile Number: Does not have one as it is a one of a kind design. Collection: Limited Edition VIP Party Release 2018. NOTE: This is a 1 of a kind original tile done by Sid Dickens specifically for this VIP customer event held at his home studio in Vancouver, Canada. If you have any questions or would like to know about any other tiles I have do not hesitate to message! The item "SID DICKENS ONE OF A KIND SIGNED MEMORY TILE BLACK AND WHITE SOLDIER" is in sale since Saturday, December 15, 2018. This item is in the category "Collectibles\Decorative Collectibles\Wall Hangings, Mirrors". The seller is "vancouversells" and is located in Vancouver, British Columbia. This item can be shipped worldwide.